What are the Best Places for Snorkeling in Cozumel? White sand beaches and calm crystal waters, is only a few of the reasons why tourists flock in this beautiful Mediterranean island called Cozumel. The earthly paradise island houses the 966-km-long (600-mile-long) Great Maya Reef, stretching from Cozumel to Central America. Divers and snorkelers alike can’t get enough of the reef systems that don’t fail to surprise and awe them. Coral reefs surround almost the entire island of Cozumel; therefore scuba diving and snorkeling are two of the main attractions in the island. Cozumel remains as one of the world’s diving meccas visited by thousands of divers each year. Therefore, without a doubt, you must find the best snorkeling tours around the island to make the most of your stay in Cozumel, an earthly paradise you will never forget. Where to go for Snorkeling in Cozumel for the best Underwater Experience? The fact is that there are many places you can go snorkeling. However, there are always some that come out for its beautiful waters, the calm of its currents, and the fish species that you can find. We have listed three of the best places to snorkel in Cozumel where you will greet by the abundance of sea creatures and towering coral reefs. Prepare your gear and don’t leave your underwater camera for an unforgettable bonding with nature’s best. Why is Villa Blanca Reef a must-go for First Time Snorkelers? The coast of Cozumel houses a long line of beautiful reef snorkeling spots by boat. One of these is Villa Blanca Reef. 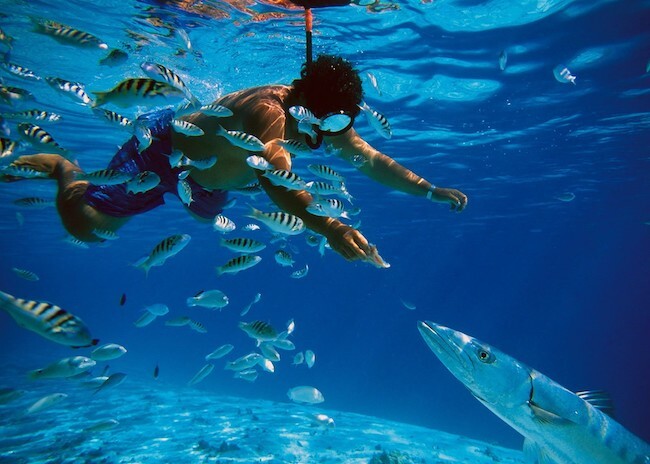 Its location and conditions make people want to do various activities in its waters, including snorkeling. Also known as Villa Blanca Shallows, this reef is a real delight for snorkelers regardless of their experience. As its name says, Villa Blanca is near a village. In this case, near the Villa Blanca Hotel. The shallows are right between the new ferry pier in Cozumel and Park Royal, a very convenient location for travelers and families. Villa Blanca is in a quite popular area, allowing you to visit many attractions and enjoy food and drinks once you're snorkeling. Also, it is an excellent snorkeling place because it is a shallow reef. Good for snorkel beginners. Snorkelers at Villa Blanca Reef can observe corals and coral formations that usually consist of sponges and sea fans. You will see some moray eels and squirrelfish too. For security, don’t forget to bring your snorkeling shoes. How to access the crystal clear waters of the Paradise Reef? It is the first reef you will see upon entering the Marine Park. Located in the western part of Cozumel, Paradise Reef is one of the most visited snorkeling sites on the island. Many types of fishes frequent this reef. Snorkelers sometimes find themselves enveloped inside passing schools of fish on the way to the bottom where they are bound to enjoy the large coral heads and snappers that swim idly below it. The majestic Queen Angelfish, red seahorse, and cute Trunkfish may also find here. During some rare instances, you will also be able to see a nicely camouflaged Scorpion Fish hiding in the crevices of a coral head. Divemasters warn snorkelers and divers not to touch them because they are poisonous. There are many other creatures to see such as schools of Grunts, Snappers, and Sergeant Majors and an assortment of nice sponges. To get there, hop on a boat tour that will take you south of Puerto Maya Cruise Ship Pier where the shallow part of Paradise Reef is. It takes about 30 minutes or less depending on the current. Why go to the earthly paradise Dzul-Ha Reef? Dzul-Ha Reef is one of the so-called natural gems of this island. In the past, this area was not very popular, but soon after the snorkelers and other water sports experts have realized the real potential of this area, this reef and beach became a real hit. Dzul-Ha is famous among snorkelers because it’s a shallow reef. It means that it’s excellent for beginners. The depth is between 10 and 15 feet. Many of the guests of the local bar are involved in snorkeling. 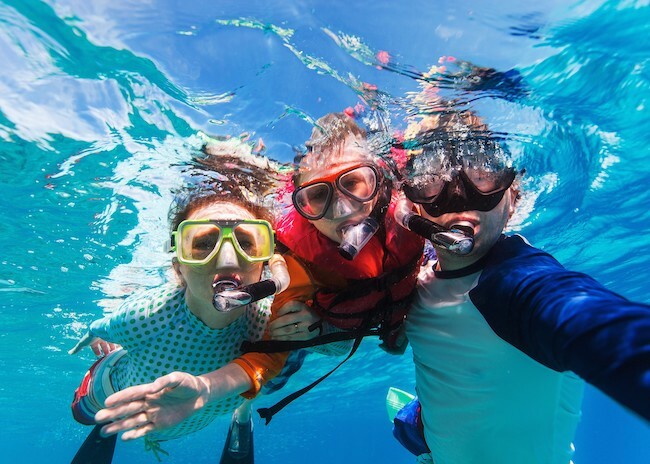 Even if you are not a seasoned snorkeler, you can rest assured that you will see at least some of the living beings found there like serpent stars, anemones, sea fans, and some other tropical fish and corals. If you are prepared to get deeper in the water, you will get a chance to see some large coral formations and larger fish too. It is also worth mentioning that this area is home to many crabs, lobsters, and rays. Without a doubt, Dzul-Ha is one of the best places to snorkel in Cozumel. Its calm waters, the color of corals and fish, everything is relaxing and pleasant. Your stay on this island will undoubtedly be unforgettable. Should I go Snorkeling in Cozumel by my own or Hire a Tour? You should probably need a tour. Plan, as you are here, to maximize your snorkeling experience in the most beautiful waters of the Caribbean Sea of Mexico. Your companions will thank you, and they will talk about this over the years. No question. It is not enough to snorkel in one place in Cozumel. It is a must to visit two or three more while you are on the island to maximize the experience. You are bound to see different kinds of reef formations and swim-throughs in each reef locations. The underwater creatures that frequent the area are also different each time. You would feel like you haven’t been to the underwater depths of Cozumel if you haven’t visited a couple of the best places to snorkel. The cozumel snorkeling map has the most fantastic snorkeling reefs that you must visit. You will arrive in awe with all the marine life and beaches surrounding you once you’re underwater. So do not keep wasting your time. Take your stuff, make a reservation as soon as possible, and enjoy a real snorkeling experience in the most relaxing, calm, and pleasant paradisiac island of Mexico.